Paris has been quite the experience. This post will discuss days 4-6. Paris has such a rich history the we explored through walking tours of the city. We visited places like the Moulin Rouge, Pantheon, the Sacré-Cœur or Sacred Heart Church, and the apartments famous writers lived. Our group had about 28 people. Most of our tours were the entire group, while some were in smaller groups. I noticed that it was much easier to stay engaged with the smaller groups [insert teacher’s classroom size argument here]. Much of Parisian history was influenced by the Roman-Catholic Church. Therefore, many of the “pretty” buildings we saw at one point in history were either churches, government establishments, or both. Even the shopping malls are art. France, has some of the best shopping in the world. We could’ve gone shopping everyday and still would not have seen all of the shopping centers. The Galleries Lafayette has several locations in France and a few global stores. The Flagship store has 7 floors; sadly, I only made it to 2 of them. France has several underground and partially underground malls. I visited 2 of them. In the larger shopping malls we saw many of the stores we see in America (Nike, H&M, Zara, Footlocker, Sephora, etc.). France has designer outlets too. The outlet mall I visited was about the size of a Tanger or Premium outlet like we have in America, but instead of having stores like Gap and Charlotte Russe (RIP), they stores like Burberry and Gucci. Do not believe the hype: not all designer shopping is cheaper in France. In general, the native country for a product is [usually] where it is the cheapest. When deciding if a product is cheaper, you must consider any tax rebates and the conversion rate. However, some brands will have exclusives overseas that you may want to consider purchasing. Point to Ponder: Today you will be visiting Little Africa. What are some of your initial observations about this area of the city? What have you observed so far about diversity in Paris? Montmartre is a very special neighborhood in Paris. 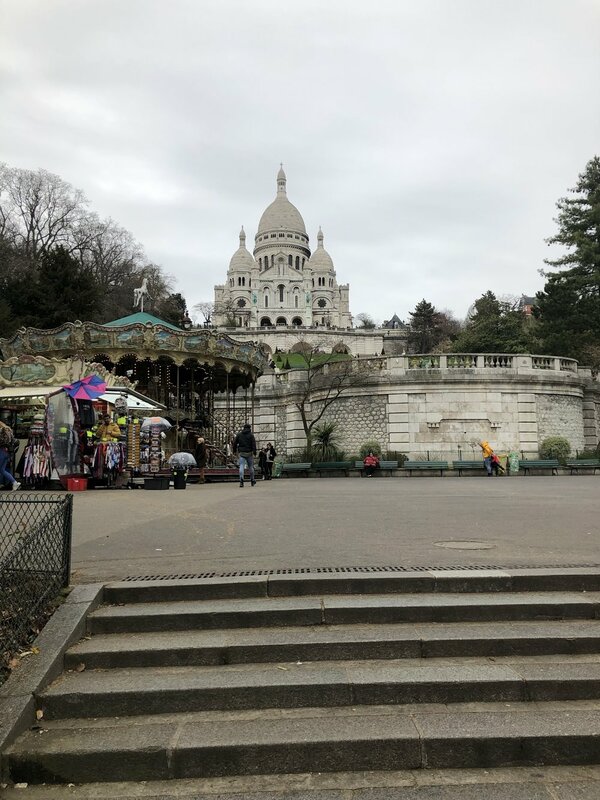 Discuss your time there in any way you like….use pictures, video, audio and or text to describe Montmartre through your eyes. Montmartre is a very special area. It was very apparent what classes of people lived in the different areas. In the working class neighborhood, we were discouraged from taking pictures because some of the street vendors were selling counterfeit goods. I will describe the scenario for you. It’s a rainy day and we get off the Metro near the Moulin Rouge. We walk through a neighborhood with the prettiest street art I’ve seen in a while. We walk past a school and through a park. We look up a hill and see the Sacré-Cœur. Our tour guide stepped in dog poop (and told us to be responsible pet owners). I know I shouldn’t laugh, but let me tell you although I had only know the tour guide a few days, he definitely did not seem like the type to get mad or blow up about those sorts of things. We proceed to an area called “Little Africa” and in this area there are tons of street vendors, barber shops, hair salons, cell phone resellers, and more. The roads are small, the buildings are Parisian but not super extravagant, and it smells of the fresh fish being sold all around. This area isn’t too big, just a few city blocks wide. In little Africa, I saw the greatest concentrated amount of African people that I had in all of Paris. Interestingly enough, the discussion of race is fairly new to France. Race is a social construct that although France doesn’t want to acknowledge, still affects the treatment of its citizens and tourist. For example, a group of my friends were denied entry to a club twice, for reasons that seemed more than just the dress code reason the bouncer gave. I also subtly different treatment of some of the people in our group by strangers. For the most part, I felt more out of place because I was a tourist and not wearing two designer brands at any given moment than any other reason while in Paris. France seems really accommodating to different ethic groups. During various activities I saw many different workers, multiracial couples and friend groups.